Sora Kim, July 13, 2017, 9:25 a.m. The daughter of former president Park Geun-hye's confidante Choi Soon-sil flatly contradicted her mother's testimony in an unexpected appearance at the trial of de facto Samsung chief Lee Jae-yong on Wednesday. Presiding Judge Kim Jin-dong confessed he had not been sure of Chung Yoo-ra's appearance "until the last minute." Chung's lawyer earlier told the court she would not be able to testify because she is separately under investigation and wants to avoid incriminating herself. Lee is charged with bribing Park and Choi, not least by buying a purebred horse and stables for Chung in Germany, where she lived since 2015. "I thought the support was related to equestrian training for the 2020 Tokyo Olympics," Chung told the court. "My mother told me to consider the horse 'your own.'" Chung changed the horse's name from Salcido to Salvatore in 2015. Prosecutors said the name change was an attempt to cover her tracks after suspicions that the horse was bought for Chug by Samsung were posted on the website of the International Federation for Equestrian Sports. "When I asked my mother why we had to change the name of the horse, she said, 'If word gets out that Samsung supported only you, things could get complicated. We have to do what Samsung tells us, so don't ask questions,'" Chung told the court. Chung abruptly swapped two horses she owned (Vitana V and Salcido) for two others (Vladimir and Stasha) in September last year, when the corruption scandal unraveled. She said her equestrian coach Christian Kamplade "told me that my mother met in Copenhagen with [former Samsung Electronics president] Park Sang-jin and [former executive director] Hwang Sung-soo before the horses were switched. My mother said Samsung suggested that we swap horses." 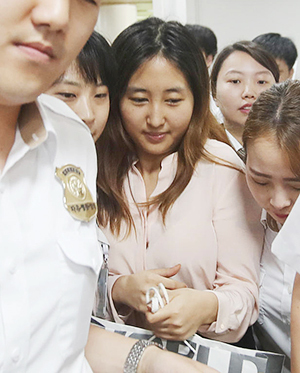 Chung's testimony directly contradicts the accounts of Lee, her mother and Park. Choi and Samsung have claimed that the horses were provided legitimately through the Korea Equestrian Federation. In Park's impeachment trial in January of this year, Choi said, "How can a big conglomerate like Samsung support only my daughter?" Samsung has denied knowing anything about the name change and the swap and blamed everything on Choi and her daughter. Lawyers for Samsung dismissed Chung's testimony as hearsay and claimed she "had no way of knowing what was said during the meeting in Copenhagen." Chung testified for four hours in the morning but then left claiming that her babysitter was only available only until 2 p.m. The Choi family lawyer Lee Kyung-jae said, "Chung left home at 5 a.m. without telling anyone and got in a waiting van. There are suspicions that her testimony was tainted by pressure and wheedling from prosecutors." But prosecutors denied offering her a deal and merely helped her get to court at her request. When an attorney for Samsung asked Chung why she decided to testify after all, she said, "It's true that a lot of people advised against me showing up today, but I felt I needed to do it. Prosecutors summoned me, so I showed up."